S. S. Stewart Banjeaurine, c. 1890, made in Philadelphia, serial # 5634, natural finish, spunover rim,cherry wood neck with ebony fingerboard, gig bag case. The Banjeurine was essentially the creation of Philadelphia's S.S. Stewart, and this is a lovely example of his factory's work. With a short scale neck but full size head these instruments were meant to be tuned to a higher pitch to play melody parts in the banjo ensembles of the 1890's, but still have a full rich tone. 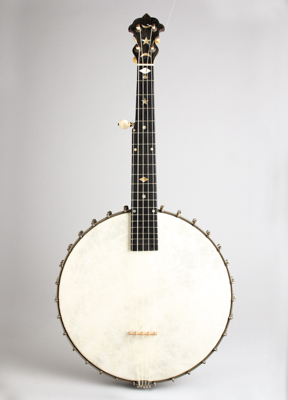 While not as often seen or played today, Banjeurines are considerably rarer than their full-scale banjo brothers, especially in the higher grades. This lovely little Stewart features a cherry neck with an ebony fingerboard with mixed diamond and star inlay, and a moon-and-star inlaid headstock. The neck/heel brace is the original heavier solid style without the turnbuckle, a specific feature of the Benjeurine which has an unconventional dowel attachment. This is a wonderful find for the banjo collector and the player with a taste for the slightly unusual! Overall length is 28 in. (71.1 cm. ), 12 in. (30.5 cm.) diameter head, and 2 1/4 in. (5.7 cm.) in depth, measured at side of rim. Scale length is 19 1/4 in. (489 mm.). Width of nut is 1 1/4 in. (32 mm.). Very nice original condition overall; The Champion friction tuners, hooks and nuts are all original. The tailpiece is a slightly later No-Knot model, and the celluloid logo plate is missing from the dowel. There is a small metal plate added at the heel inside the rim to strengthen the joint where the neck attaches, and the small screws attaching the neck brace are not original. There is some general wear overall, the most notable is finish worn away from the back of the neck and plating wear to the hooks and most notably on the neck tension bar. The instrument is in excellent playing condition, set up with a modern plastic head, reproduction Cole-style bridge and new Nylgut strings. The Banjuerine has a unique, rather enchanting sound and this one is no exception. Excellent - Condition.